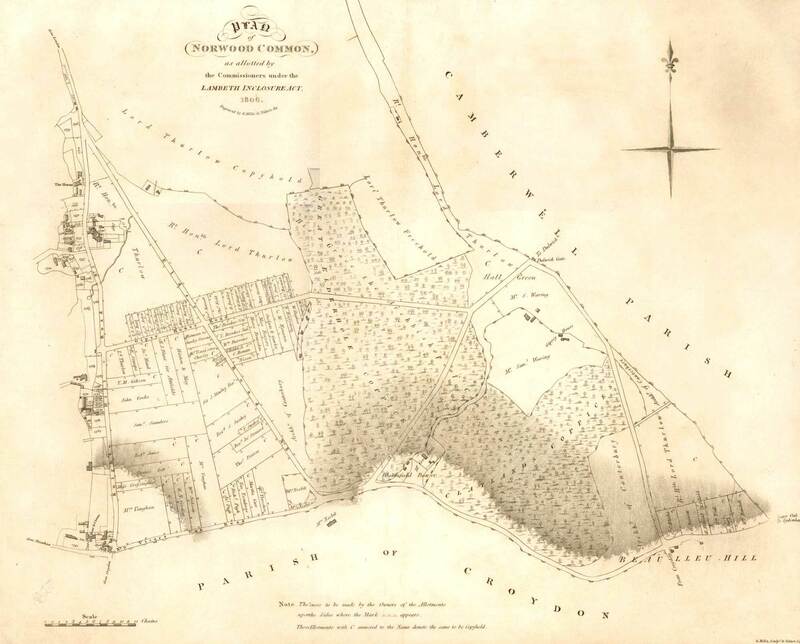 A map of the area between Knights Hill in the west and Gypsy Hill in the east showing the ownership of the area following the passing of the Enclosure Act of 1806. A considerable amount of land is shown in the owner-ship of Lord Thurlow, the Lord Chancellor in the late 18th century. The remaining wooded areas, part of the original Great North Wood are shown in the ownership of the Archbishop of Canterbury. Many of the plots are marked with the letter C which stands for 'Copyhold' a form of tenancy, that was turned into freehold in 1926. The section of Elder Road shown is now Norwood High Street; and Gipsy House Road is now Chapel Road. Print of a plan engraved by G. Mills, 1806.